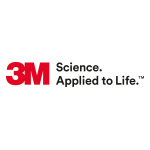 ST. PAUL, Minn.--(BUSINESS WIRE)--Today, 3M (MMM), a global science and innovation company, revealed the findings from its 2019 State of Science Index (SOSI), a third-party, independently researched study. 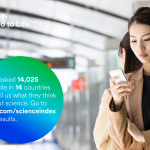 A survey of about 14,000 people across 14 countries, the study is designed to gauge shifting global attitudes toward science. Ultimately, amid hopes for the role science plays in creating a brighter future and its potential to solve global challenges, the survey found that scientific skepticism has grown, leading 3M to conclude that science needs advocates now more than ever. 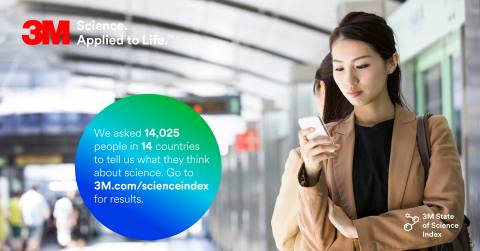 The survey reveals that 87 percent of the global community believes we need science to solve the world’s problems, and a majority also believe the best days of science are yet to come (62 percent). However, skepticism of science grew three percentage points globally and six percentage points in the United States last year (from 27 percent to 33 percent), with nearly half the world stating they only believe in science that aligns with – and likely reinforces – their personal beliefs (45 percent). The survey also reveals only 20 percent of people stand up for science when debating its merits with others. One theory to explain this contradiction is that supporters of science may not be aware there is a need for advocacy. Continuing the theme of human interest, the study found most of the world places a higher value on humans than artificial intelligence (AI). The survey posed a series of questions to determine people’s preference for human or digital connection. Almost everyone (87 percent) would choose to make five real friends rather than attract 5,000 new followers on social media*; 64 percent would opt to own a regular car over a self-driving car; and 74 percent would rather have a human assistant than a robot assistant. AI also generates some fear about the role of science and technology in the future, with more than half (52 percent) citing the role of robots in the workplace as something that makes them feel afraid rather than excited. Throughout the year, 3M will partner with various organizations to advocate for science and STEM initiatives, and 3M’s Chief Science Advocate, Dr. Jayshree Seth, will continue to champion science through content and speaking engagements, in the United States and abroad. Global research firm Ipsos conducted the study of 14,025 adults across 14 countries July 13 – September 10, 2018. The survey was fielded through a combination of online and offline interviews. Approximately 1,000 people aged 18+ were surveyed in each country. Countries in the study include: Brazil, Canada, China, Germany, India, Japan, Mexico, Poland, Singapore, South Africa, South Korea, Spain, United Kingdom, and United States. The sample for each country was nationally representative based on age, gender, region, and race/ethnicity (where applicable). The precision of Ipsos online polls is measured using a credibility interval. In this case, the poll has a credibility interval of ± 0.9 percentage points for all respondents. *Asterisk indicates that the data cited excludes “prefer not to answer” responses.